According to the Chartered Institute of Building (CIOB) one in five tradespeople experience theft and vandalism every single week, with many crimes not being reported so the figures are undoubtedly conservative. It paints an extremely concerning picture, especially as insurers Allianz Cornhill reckon that theft alone is estimated to cost the UK construction industry more than a staggering £800m annually. Sussex Police Inspector, Peter Dommett, who leads a crime prevention team in the region agrees. “These crimes are on the increase, with expensive tools and plant being stolen. We get at least one report a day in Mid-Sussex alone, often with shipping or site containers being broken into. We’ve even seen ‘walk-on’ thefts where people dress as workers and simply walk about taking items in broad daylight”. Park as near your home as possible and if you park on your own drive and the vehicle is visible, install security lighting to keep it illuminated and a CCTV camera as well. If you can have locked secure gates across the drive so much the better. You need as many deterrents as possible! Park the vehicle up against a wall or garage door to make access difficult. Make sure the vehicle is alarmed and install extra security locks. Keep as many of your tools and equipment indoors if at all possible. Keep your site illuminated even when it’s closed. Thieves count on being able to remain inconspicuous so don’t make life easy for them. Plan ahead. Don’t keep an excess of materials. If you can, purchase or delay delivery of what you need for when you need it so it isn’t sitting there waiting to be stolen. This obviously requires good planning and communication between you and your suppliers but why leave temptation lying around if you can help it? Have a fortress mentality. 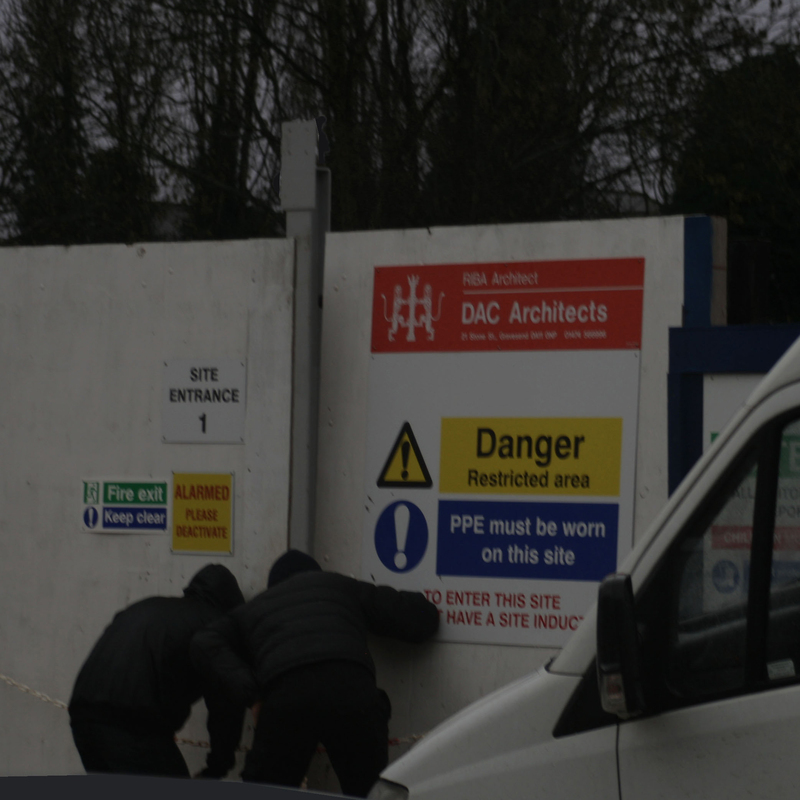 Ensure your perimeter fencing and access gates are as strong and as secure as possible and carry prominent warning signs that CCTV and alarms are in operation. The fewer site access points, the better. Remove temptation. Lock all tools and small or valuable equipment or materials away securely, or remove from the site to safe storage if possible, especially over a longer shutdown period. If this isn’t feasible, securely label all plant, tools and equipment with an indelible i.d. mark and ensure they are listed on a police-approved national tool register so if they’re lost or stolen this could help their recovery. Keep out! Consider temporary concrete barriers to block entry to the site. This will prevent ingress of vehicles and make it more difficult to load any heavy or bulky materials. They can be easily and quickly positioned and removed and are such a simple solution for a closure of a couple of weeks or so. We’re watching you! 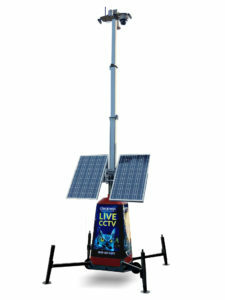 Install a mobile CCTV camera tower along with good site lighting. Why would thieves target a difficult to access site that’s well lit, with remote cameras and movement sensors surveying everything, when they can find a dark, unsecured alternative? For construction sites, solar powered mobile camera towers are an ideal security solution. Running off mains or solar power and communicating via the mobile network, Clearway’s camera towers can be your eyes with virtually 360˚ coverage. They survey all the site with their swivelling, high-definition movement-activated cameras and when triggered, they can issue voiced warnings to trespassers so they know they’ve been spotted. The activation and live video are instantly beamed back to Clearway’s state-of-the-art NSI Gold Alarm Receiving Centre who, in turn, will raise an alarm, send out a security guard patrol and/or contact the police to apprehend the intruders. Have you signed this petition calling for more to be done about tool theft?